It had to happen right? There's a cabrio version of the 2015 Audi A3. There's the monster 300 horsepower powertrain of the 2015 Audi S3. Let them get nasty together and the 2015 Audi S3 Cabriolet is what happens. We have more photos but still no answer as to whether or not it's coming here. 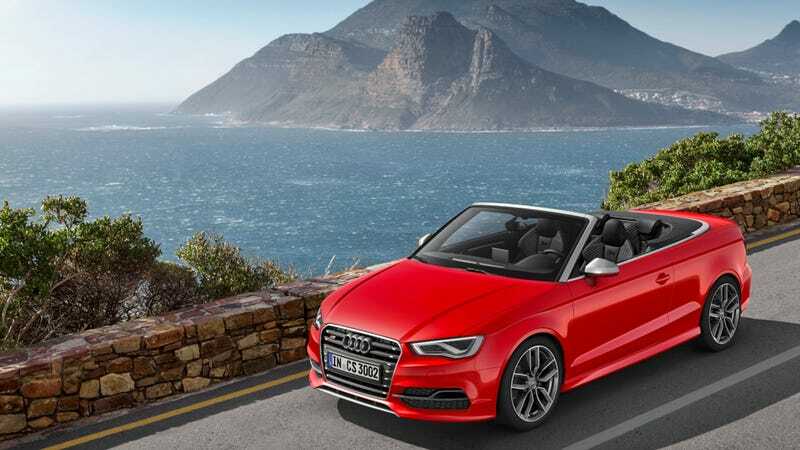 Are You The 2015 Audi A3 Cabriolet? Like it's four doored pedestrian counterpart, the S3 Cabriolet has 300 horsepower and 280 pound feet of torque. But now, instead of just converting that power into forward motion, it'll also have the ability to gently tousle your hair and move important documents from inside the vehicle to outside. The sedan's roof is fixed unless something has gone very wrong. Here, in just 18 seconds you go from roofed to open top enjoyment. Pretty much everything else will be shared with the S3 sedan, so that means the same six speed DSG transmission, the same lovely interior, the same chiseled good looks, and the same color choices. When I drove the 2015 S3 last year, Audi said they would only be bringing the cabrio to America in base 2.0T guise, and if we wanted a faster one to "get an S5." Let's see how long that stays true. The S3 cab will be on sale in Germany this summer. It may or may not enter the USA after that. And if it does come here, I'd imagine it'd cost more than the rumored $41,100 that the 2015 S3 might cost.